Sometimes music is entertaining. Sometimes it’s the background noise that keeps us company. Sometimes it is an escape. Then there are those other times. The music takes us somewhere. 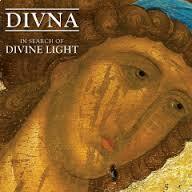 It returns us to ourselves, taking us into the “deep heart.” That’s how I experience the music of Divna. I was, therefore, delighted when Valley Entertainment sent me her newest album, In Search of the Divine Light, and asked me to write a review. The album is available from Valley Entertainment, Amazon, and the iTunes Store. Valley Entertainment describes the album as “a collection of sacred chants from the Byzantine, Russian, Serbian and Bulgarian traditions.” I don’t know the words Divna sings but I understand them. She sings in the “native language” (Acts 2:8) of Pentecost, a language that is heard and understood with the ears of the heart. That is the paradox of really good sacred music. It presents a language beyond the words and “deep calls to deep” (Ps. 42:7). Divna Ljubojević is a Serbian cantor and “is considered one of the leading interpreters and performers of the liturgical traditions and Byzantine chant.” This type of music is often associated with the deep, heavy, and muscular voices of men. That is not Divna and yet she brings to this sacred tradition music that is every bit as profound, beautiful, and transcendent. Her voice is a carrier not just of words and musical notes but of the human soul, hers and ours. Indeed. I like the description “genuine.” Thanks Julien. Thank you Ann. I hope you enjoy the music. Me too! I am glad you like it.